Company can sell the goods on credit or cash. Cash sale is inflow of cash and it is controlled under cash flow analysis. But credit sale creates sundry debtors. Company has to receive money from them. If company starts to sell on return of cash, then it decreases the level of company’s sale and profitability. On the other side, if company promotes credit sale, it can increase the risk of bad debts. So, it is required to control and to manage debtors. Debtor management means the process of decisions relating to the investment in business debtors. In credit selling, it is certain that we have to pay the cost of getting money from debtors and to take some risk of loss due to bad debts. 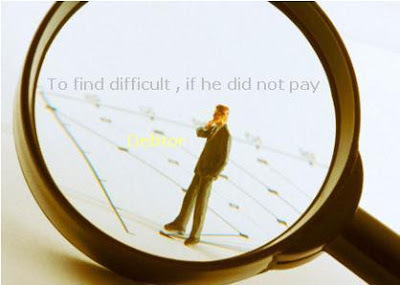 To minimize the loss due to not receiving money from debtors is the main aim of debtor management. Credit policy effects debtor management because it guides management about how to control debtors and how to make balance between liberal and strict credit. If company does not restrict to sell the products on credit after a given limit of sale. This liberated credit policy will increase the amount of sale and profitability. But risk will also increase with increasing of sale. If we sell the good to those debtors whose capability to pay is not good, then it is possible that some amount will become bad debts. Company can increase the time limit for paying by such debtors. On the other hand, if company’s credit policy is strict, then it will increase liquidity and security, but decrease the profitability. So, finance manager should make credit policy at optimum level where profitability and liquidity will be equal. We can show it graphically. Length of credit period is also an element that affects decisions of finance manager relating to manage debtors. It is the time which allows to debtor to pay his debt for purchasing goods on credit from vendor. Finance manager can increase the length of credit period according to reputation of customers. Cash discount is technique to get money fastly from debtors. It is cost of investment in credit sale. It means decision relating to analysis of credit policy. Evaluation and analysis of credit policy is based on following factors. For analysis the financial position of debtors, we have to collect the information relating to debtors. This information can be obtained from customer’s financial statements of previous years, bank reports, and information given by credit rating agencies. These information will be useful for deciding where debtors will our debt or not. It will also be useful for knowing capability to pay the debt. After collection and analysis the debtor’s information, manager has to decide whether company should facilitate to sell goods on credit or not. If company sells the goods on credit to particular debtor, then at what level it will be sold after seeing his position. For this manager can fix the standard for providing goods on credit. If a particular debtor is below than given standard, then he should not accept his proposal of buying goods on credit. For getting fund fastly from debtor, the following steps will be taken under formulation of collection policy. b) Take the help of debt collection agency for getting bad debt. c) To do legal action against bad debtors. d) To request personally to debtor to pay his dues on mobile or email. debtor and their turnover ratio. f) To make ageing schedule. Sample of Ageing schedule is given below.